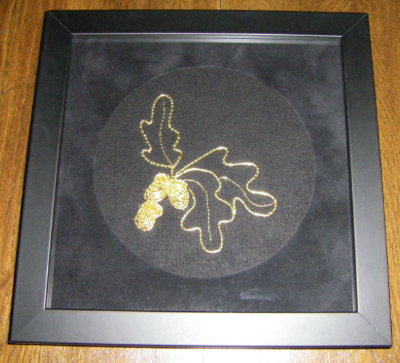 Embroiderers' Association of Canada, Inc.: Mid May, time for a stitching check in..
Dare I say it? Has spring really arrived?.. it sure looks like it, the leaves on the trees are beginning to pop out, and the wide array of spring flowers are in bloom, colours everywhere! At long last…. I think spring has arrived, but we can also expect some very cool, if not cold, overnight temperatures before we are truly out of the cold weather cycle, mid May not withstanding. So, on that note, what have I been up to over the cold winter months? You will recall from my March blog that I laid it all out for everyone to read… what UFOs I would work on this year, along with working on other projects. I must say that I am quite pleased with the progress I have made on my stitched pieces. Mountmellick takes to the Sea is not only finished but also framed. Happiness! 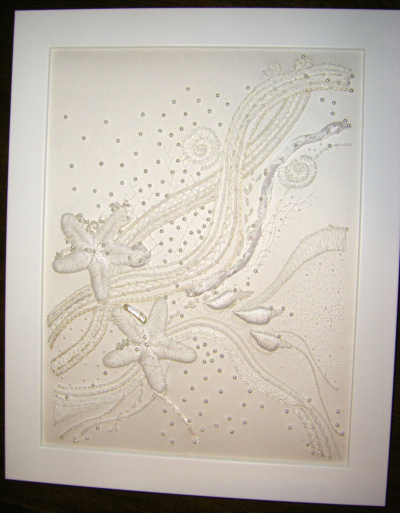 When I brought it for framing, I also had a couple of other pieces framed, Florentine Fancy, an EAC Intermediate Canvas Group course, and the introductory metal work piece. It is always nice to see the finished pieces framed and hung for enjoyment. Other pieces are getting attention as are the Cyber courses EAC is offering along with the two Cyber courses the Cyber chapter sponsored. The canvas candy bowl is one that has been completed and on display. I have been working on some more than others, but they will all get their share of attention in their allocated time frames. With the arrival of warm weather many of us will turn our thoughts to gardening, travel or stitching outside (or some of each). Where are some of your favourite places to stitch in summer? Will you take stitching projects with you when you travel? It is never to early to think of these things. I always take some projects with me when I am away from home. However I have found that I stitch better inside than in most places outside. I find the novelty of the warm fresh air and scenery to be a distraction, but I am working on finding the perfect outdoors spot for stitching, stay tuned, I will share it with you when I finally settle on one. 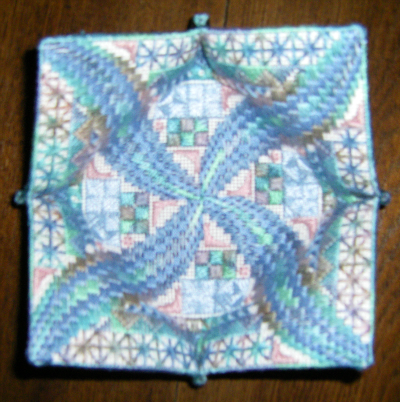 This is Seminar week, hosted by Ottawa Valley Guild of Stitchery, and the clock is now ticking on the 2015 Seminar hosted by the Calgary Guild of Needle & Fibre Arts. If you have not had the opportunity to attend a Seminar, perhaps now is the time to give some thought to attending one. It is an experience you will not soon forget. After attending a number of Seminars, I am not attending this one for a variety of reasons, but I have already noted on my calendar my travel to Calgary for Seminar 2015. Perhaps we might meet there? I often take a few projects with me when we travel. Small stitching projects work best unless I know I'm going to have space to set up comfortably. I often take knitting projects with me. 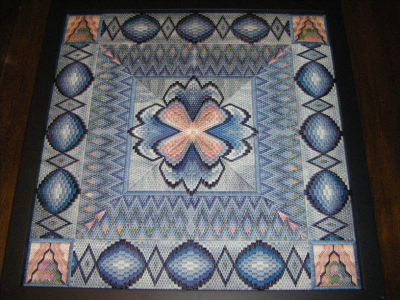 I love seeing these finished projects Marie - beautiful work! I don't seem to stitch outdoors - love the idea in theory but it is usually too windy here and my threads go flying.